To begin with, every sincere and practicing born again believer in evangelical circles is heaven-bound. Not even hell can contest that. We are sealed as God’s children in the body of Christ and the Spirit in us bears witness to that. However, it would be wrong to assume that all the doctrinal beliefs held in our various evangelical denominations are infallible or free from error. The church, the bride of Christ, is fallible and liable to err. By the end of this book you’ll understand how fallible we are and that in our fallibility we are still 100 percent God’s children and his elect. You’ll also learn that being in err has its consequences in this life. It may not affect our place in eternity if we are innocently deceived yet it does affect our outcomes in this life. That is why it’s not worth entertaining erroneous teachings when they are revealed. No single denomination can claim to be free from error on all its doctrines and beliefs. Such a claim would be at best naïve and at worst an expression of pride. It is a false assumption even when we may not know what the major error(s) may be. The Lord has exposed some level of error in every church and denomination throughout history. Thus even today no single denomination can be the exception, not in this fallible life. The International Standard Bible Encyclopedia says “The history of the church shows that it has been as liable to error, and as readily influenced by natural conditions, as any other human institutions,” (ISB Encyclopedia, “Authority in Religion: V. Classification of Theories”). Exposing the errors has been our Lord’s way of building, growing and maturing his church. Those that made changes have steered the church to higher levels of obedience, truth, and usefulness. The Bible says we do not yet have perfect knowledge of everything, until this present world passes away. “For we know in part and we prophesy in part, but when perfection comes, the imperfect disappears.” 1 Corinthians 13:9-10. The imperfect knowledge we have will be replaced by the perfect. We therefore only know in part, according to the level the Lord chooses to reveal. More revelation brings more freedom and more power in the body of Christ against Satan’s works on earth. “If you hold to my teaching, you are really my disciples. Then you will know the truth, and the truth will set you free,” John 8:31-32. A truth revealed to correct an error is therefore a sign that the Lord is taking us to a new level of freedom. It’s a sign that he is closing the door Satan legally used to attack us through our ignorance. We understand that hell will stop at nothing in attempting to rob or even destroy God’s elect. Deception has been his major weapon of attack. Deception feeds on ignorance. Our level of deception therefore depends on our level of ignorance. The Lord also allows that we remain ignorant on particular truths we may not be able to handle. “I have much more to say to you, more than you can now bear,” John 16:12. At each point in church history and even in our individual lives the Lord has been revealing more to us in relation to what we can effectively bear. There is therefore more to be revealed to us in the measure that we can handle. He reveals to us the amount we can handle per time. This often happens when dealing with revelations that will drastically change our understanding. By the time we get the whole truth we’re able to accept it without it seeming controversial. It’s able to replace old beliefs we had always assumed were true. Unfortunately every error has had its level of negative consequences. Being outside God’s will it opens legal access for Satan to attack. In the body of Christ, errors limit our effectiveness, fruitfulness and triumph over evil on both an individual and corporate level. For example, the Pope of the Catholic Church was in 1870, declared to be infallible. He was said to be immune from liability to error or failure. He exalted himself above humanity and equated himself with heavenly beings. At some point something had to bring the papacy (church government of the Roman Catholic Church) to the truth before their claim to infallibility brought more chaos. Combined with other errors this infallibility false doctrine/teaching added to the decline of the reign of the Catholic Church. It continued to lose its immense political authority God entrusted it with over the most powerful nations at the time. By 1929, the Catholic Church’s political influence was reduced to what is now the Vatican nation, a tiny piece of land. This is a church that once controlled the power and wealth of numerous nations throughout the world. Since its downfall the Lord has never entrusted any other church body with so much political, economic, social, and spiritual authority. The gospel would have been evangelized throughout the world by now had such immense authority remained to the body of Christ, particularly with the evangelical denominations. With few of the major errors on scripture corrected the Catholic Church has been labeled by many Protestants as a modern day Pharisee. Obedience to maintaining established tradition became more important than the willingness to change when errors were revealed. It has been accused of resisting to move with the Spirit of God. We, in the evangelical circles, will not be spared from consequences of embracing errors if we fall in the same trap. This includes embracing errors on spiritual warfare and deliverance teachings. 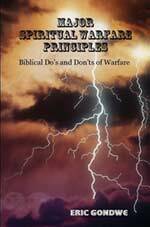 The erroneous spiritual warfare teachings advocating for direct confrontation against the kingdom of hell started primarily in the 1980s. The enemy showed up, disguised as an “angel of light” to add in his poison as the Body of Christ has been advancing and preparing the soon return of Christ. Many of the deceptive kinds of spiritual warfare strategies that infiltrated the church have been revealed in the body of Christ. These include scolding Satan, repeated chants of binding and rebuking him, stomping on the ground in a symbolic expression of crushing him, chaining him or his demons and casting him into some imaginary place like fire, hell, a pot, etc. It’s amazing what we, in the body of Christ, have been doing in the name of spiritual warfare for the past few decades. Such erroneous spiritual warfare and deliverance has only led us to stray into spiritual territory that’s not in our realm of authority (domain) and led to unfortunate counterattacks. The counterattacks could have been avoided if we had not trespassed into forbidden territory. This has been much to the enemy’s pleasure to see God’s people being destroyed for lack of proper knowledge.